The Lock Element can be very useful to avoid accidentally pressing buttons. However, it is only suitable for multi-touch devices such as tablets or mobile phones. On a regular computer, you can use the analogous function called Lock Key. The principle is the same as for a Lock Element; however, instead of selecting a graphical object as your lock element, you select a key that must be pressed to enable the write/set commands. 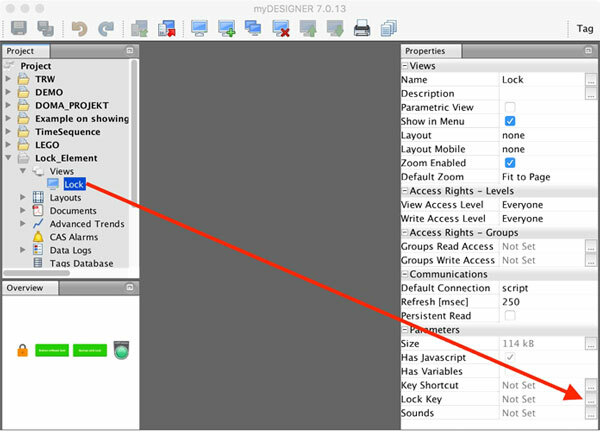 To enable this feature, please navigate to your view in the Project tree and press the Lock Key in the Properties window. Now press the “KBE” button to register your new Lock Key. Now press the key you would like to use as your Lock Key. Your new Lock Key is registered. Once your Lock Key is registered, you can work with your Write/Set commands. The usage is the same as described in the previous section. The right button will be unlocked by pressing and holding the space button.